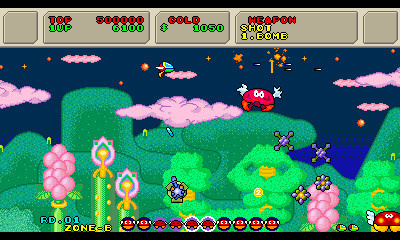 Fantasy Zone II was developed and released for the Sega Master System back in 1987. Unfortunately the limitations of the console (the original Fantasy Zone was built on Sega's more powerful System 16 arcade hardware) crippled the design aspirations; admirable attempts to include new gameplay elements weren't successful and ultimately, it wasn't very good. In 2008 Fantasy Zone finally received the true sequel it deserved via developer M2's remake (included in a Japan-only PS2 Fantasy Zone compilation) and it's dramatically superior in design, gameplay and presentation. In an additional stroke of genius, M2 created its new vision as though it had been made for 1980s arcades; more specifically by developing on an enhanced version of the System 16 arcade board. In short, it's the arcade release that never was, right down to a 1987 Sega copyright notice on the title screen. Thankfully, this Nintendo 3DS iteration is based on the M2 remake and not the Master System original, ensuring the gorgeous re-drawn visuals are present and correct. Additionally the play area has been increased to fill the entire top screen of the 3DS, allowing for more time to react to incoming enemies and obstacles. The stereoscopic 3D is also brilliantly executed; multiple layers of depth-filled parallax scroll past smoothly, while in the foreground enemies pop-out with excellent clarity. Having the 3D slider up is definitely our preferred way to play. If you've already spent some time with the first game you'll be quite at home with the sequel; in basic terms, it's more of the same. Set ten years after, the original hero Opa-Opa finds his home turf under threat once again. Taking to the skies you battle across seven increasingly difficult rounds, clearing each of all invading enemy bases followed by a boss fight. The final eighth round is a regurgitated boss-rush culminating in a final battle (which we won't spoil). New to the sequel, the first seven Rounds all have two variations – a Bright Side and a Dark Side. Players can move between these via warp gates which appear when certain enemy bases are destroyed. The Dark Side is essentially a harder version of the current round, where enemies are more intense and plentiful, but provide more coins as a reward. The visuals also become appropriately darker and more menacing. Bases destroyed in the Bright Side remain destroyed upon transitioning to the Dark Side, and vice-versa if you choose to warp back. It's the classic risk-reward scenario, however completing all the boss battles whilst in the Dark Side is the only way to reach the best ending - the bottom touch screen is used to track your route through the rounds. Power-ups are purchased from floating shops, which are harder to locate whilst in the Dark Side. Aside from the obvious benefits, owning a powered-up main weapon provides protection from a single hit, but results in the loss of the weapon. Some weapons that were single use in the original game are now unlimited (such as the Heavy Bomb) but require a couple of seconds to charge per use; a slightly refined system rather than a revolution. 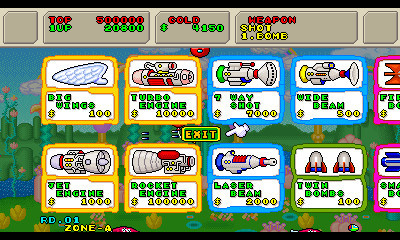 All coins collected are automatically stored in a bank, which can be withdrawn from at the beginning of each game allowing instant access to expensive weaponry. Building up coin savings is also the key to extra options, which unlock at specific amounts and provide further assistance to players struggling with the difficulty. Link Loop Land is a refreshing way to approach Fantasy Zone, feeling more akin to the original Geometry Wars with regards the ever increasing wave difficulty, and is an ideal mode for short bursts of play. A final shout-out must be given to the soundtrack, which has been arranged and composed by Manabu Namiki (whose impressive musical credentials include a slew of classic 2D shooters). It really is fantastic and provides a perfect partner to the superb visuals. To summarise, 3D Fantasy Zone II is a wonderfully sublime shooter that works perfectly as a handheld title. Developer M2 performed wonders with the original PS2 remake, but here on 3DS the team has outdone itself. It's hard to see how even M2 can raise the bar in terms of retro-remakes, and certainly bodes well for upcoming releases. As with Out Run, the Nintendo 3DS is now home to the best version of Fantasy Zone II and, in our opinion, the best Fantasy Zone game in the entire series. If you have even a passing interest in the genre, you should pick this one up straight away. I've been enjoying it since it released, but... is that a Baby D reference at the start of the article? Fantasy Zone II was good on the Master System. (Certainly more interesting than the first). Better port. (Nowhere near as bad as some of the terrible NES Arcade ports anyway that shouldn't ever have been released in favour of the Arcade original). I'll pass the fantasy zone games in favor of Thunderblade and Streets of rage and sonic 2. If I remember correctly (probably wrong), I last remember seeing Opa Opa in Sonic & SEGA All-Stars Racing. One of my favourite non-Mario Kart racers. Damm those sound effects are really irritating if that cant be adjusted in the game and turned down ill have to opt out on this one. Awesome cute'em up! Love these 3d emulator releases with so much control in the system options. We are at a desperate need for more shmups on the 3ds! Keep em coming, whether re-release or new titles. Is thunderblade available outside JP on the 3ds yet? I'm in NY, so I know that we don't have it yet. I really liked this game on the Master System despite its shortcomings so I may have to try this out. My friend had the "roller controller" for the Master System and it worked great with this game giving precision movement so you could have a high speed. Not sure why else that controller was released and I never asked why he got it. Sega is really showing Nintendo up when it comes to these re-releases of all it's classic 16bit games. I mean why isn't Nintendo doing this with its own great 16bit classics? There's a long list of amazing SNES games that would just be awesome given this kind of modern and truly loving treatment. 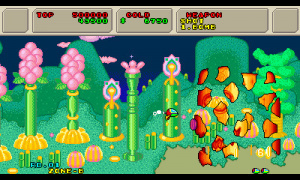 The one thing this version of the game doesn't have that I absolutely loved from the original Master System version is the paper money that floated down when you killed the bases and coins that actually bounced with the relative speed/inertia of the enemy that was defeated (both horizontally and vertically). It's a small touch but it was always so satisfying collecting the notes as they floated to the ground alongside having to sometimes chase the normal bouncing coins. For reference: https://www.youtube.com/watch?v=H2RUody7rNM The 3DS version of the game still looks totally sweet though. PS. 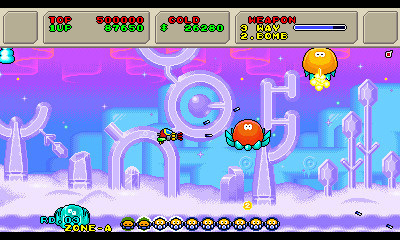 Fantasy Zone II is one of my favourite shmups of all time. Specifically the Master System version since that's the one I played but I imagine this is just as good if not better in many ways. PPS. Please don't be daft and say that Fantasy Zone II on Master System was pretty rubbish. It's probably the best shooter on the system, certainly imo (although also widely regarded as such), and is great fun in its own right. Edit: Also; there were some cool little touches in the Master System version that just worked; like the feet not actually coming out from the bottom of the ship until you were touching the ground, so it looked like it was a proper flying ship when in the air, which makes sense, and was kinda lowering it's landing gears (feet) as you approached the ground. It's the little details. Spot on review and I gotta say, the most fun I am having on my 3DS at the moment. Link Loop Land is an awesome score attack mode. @Kirk Exactly to many Fanboys are supporting their lazy nonsense Sega are charging around the same price as Nintendo but just look at the work/love Sega are showing their catalogue, Nintendo it doesn't matter fanboys will support them. I hope everyone has been reading the M2 interviews over at the Sega Blog for each of these re-releases. It's a good way to really appreciate what's been put into these games! Good rating! Passed on the original, because of what I read here at NL, but bought this before the review from a hunch. Really glad I did, because the game is pretty sweet! The endless mode surprised me, being more fun and hectic than I anticipated. @Kirk I love the Master System version. And find it actually better in some ways than this 3D remake of the arcade port. I did get it, finished it with all three endings, and love what M2 did here once again. BUT: the potions are gone, that you could buy (and find) in the SMS version, as well as the possibility to permanently upgrade your standard bullets. And there's always just a light and dark zone in each level, whereas the SMS version had levels with 3 zones. Also you could decide when to enter the boss fight and the shops were permanent. Those are all things that made the sms version extremly good, in my opinion. So yeah, the remake is great, but you have to keep in mind it is the remake of the arcade port and not the original MKIII/SMS version. @adzix Totally agree with all of those observations. Still no sign of OutRun in the Australian store. Why, God, WHY?!!! Cmon sega!! Wii u eshop please!! Sooo many sega classics out there!!! @DreamOn thanks for the tip! Mostly good review. Although I totally disagree with the opening comments about the Master System version of FZ2. I really enjoyed the game back in the day. I thought the pacing, difficulty, game mechanics, bright colourful graphics and excellent BGM all played to the console's strengths and made it one of the best games in the system's library. Anyway, I'm looking forward to playing this new version, have d/l'd but going to finish a couple od games in my backlog before i start. 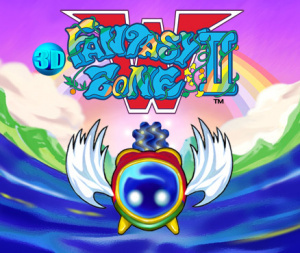 Always been a sucker for the Fantasy Zone games, so I'm definitely going to grab this one. I never did get this for anything else, so I might have to grab it soon-ish. @Corbs Wow Corbie haven't seen you post in ages! I really miss your reviews though those were great.